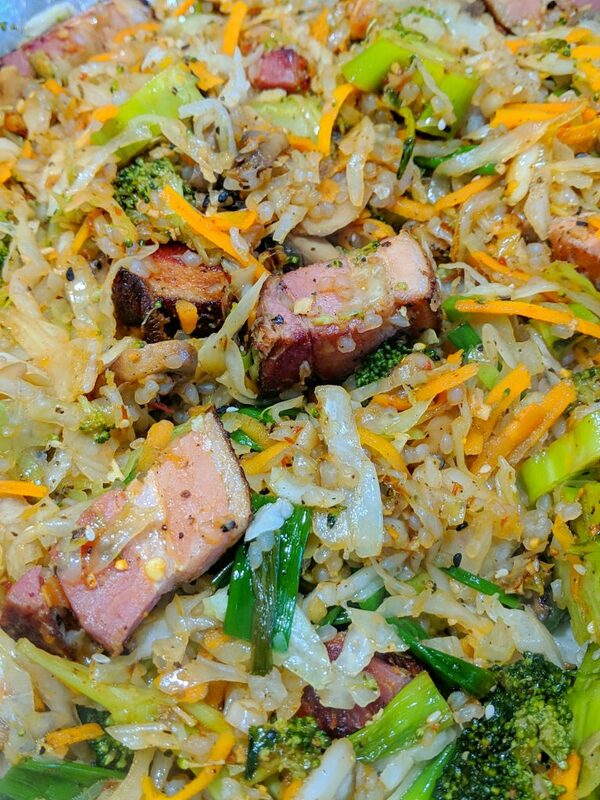 No shortage of flavor in this ketofied pork fried rice recipe. Great for meal prep or just a quick healthy meal you’ll be eating in less than 15 minutes. 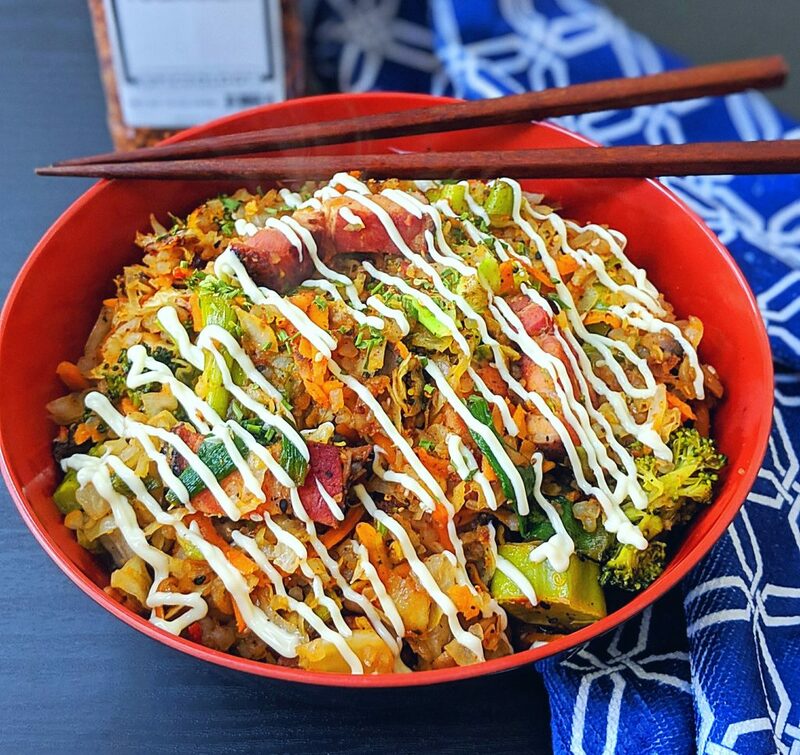 If you need something quick and easy that will keep you full without slowing you down this low carb fried rice is a must try. The spice blend has many different variations but commonly contains a combination of: coarsely ground red chili pepper, ground sanshō (“Japanese pepper”), roasted orange peel (Chenpi), black sesame seed, white sesame seed, hemp seed, ground ginger, nori or aonori (seaweed) and poppy seed. Togarashi can be used as an ingredient in recipes or as a seasoning used to crust meats and fish. It’s a great way to add spice to a dish without the overly acidic flavors that a hot sauce might have. You can use it just like you would salt and pepper to shake on top of anything from stir frys and salad to a pork loin or seared tuna. Though it is a very versatile spice blend it’s not near as commonly used in North America as a curry powder or Chinese five spice blend. 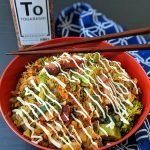 In this pork fried rice recipe I incorporate the Togarashi in with the rice as well as an extra shake on top as a garnish. If you aren’t a fan of spicy foods don’t be afraid to try this spice blend, though it does have ground chili peppers it is not very intense and cut with the other non spicy ingredients. 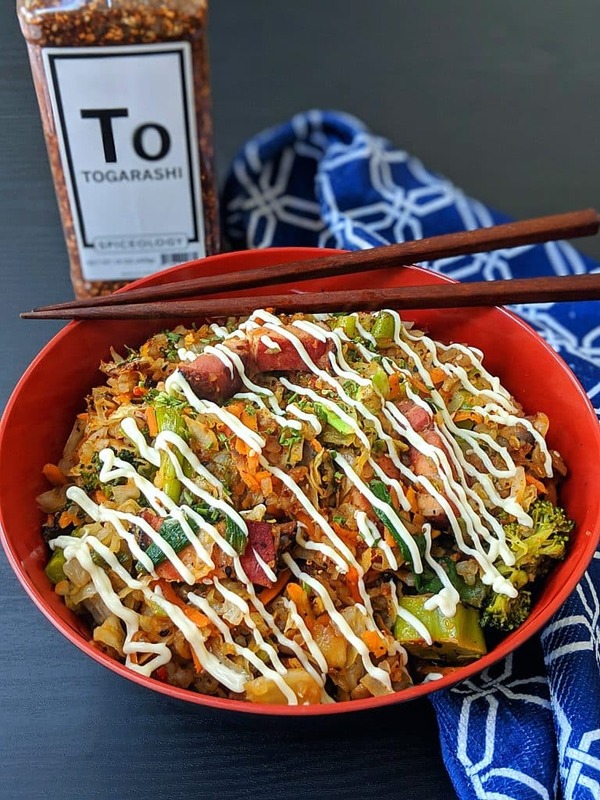 Togarashi is a fantastic low calorie almost no carb ingredient that can take boring dishes and give them a flavorful pop without overwhelming your palate. Once you try it I think you’ll be making it a part of all sorts of future recipes. Pork: The other white meat. One of the best things about pork is how many different form it can come in. Bacon, ham, pork belly, loins…I could go on for days. The beauty of this recipe is it will work with whatever kind of pork you have on hand. Today I just happened to have a beautiful hunk of slab Berkshire bacon house cured by one of my chef pals at his restaurant, Yes you should be jealous. I cubed up about 6 oz. and rendered the pork in a pan to get a perfect crust and release the natural fat to sauté the rest of the ingredients so that the porky goodness would permeate the entire dish. Berkshire pork is a prized breed of pig that’s lineage can be traced back to the English country. The pig is normally black in color and is nowadays raised in many parts of the world. The Japanese variety Kurobuta is known as the Kobe of pork and demands a hefty price tag due to its rise in popularity among chefs and foodies. All that being said and I highly recommend giving Berkshire or Kurobuta pork a try if the opportunity presents itself your half eaten pork chop that you bought at Aldi will work just fine. Truly any cut of pork you have on hand will work fine. You may even want to mix it up by using a few slices of bacon as well as some lean loin chop meat to add fat and flavor. 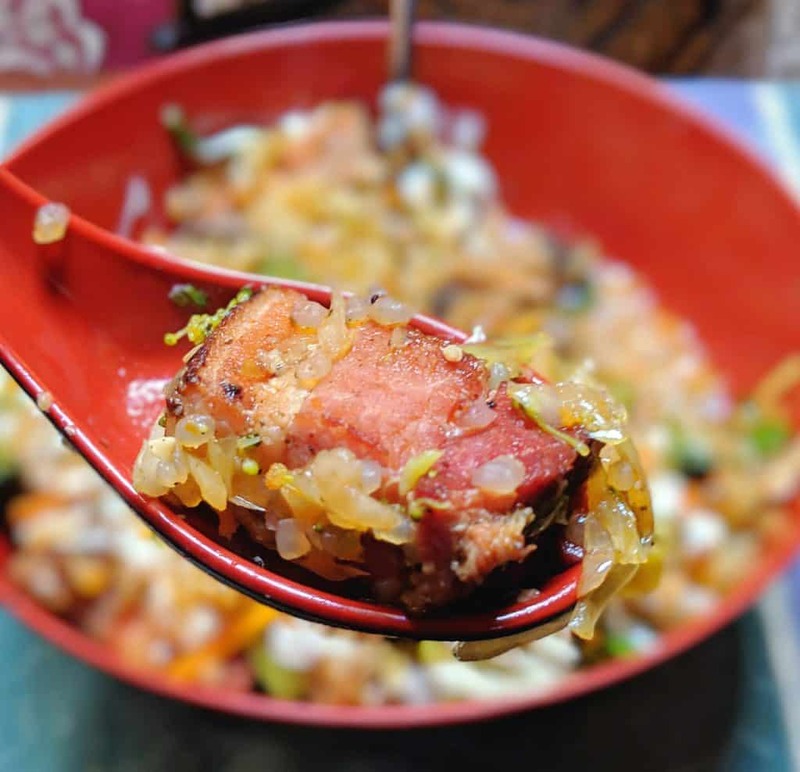 In a pinch I’ve even used diced sausage or spam…”don’t knock it” to step up the flavor in the dish. Use whatever pork works for you. Not everyone has access to heritage breeds and pasture raised meats, sometimes you have to use what you have on hand, and trust me you can lose weight just fine eating at Aldi. Mix and match and make it work for you. I was just talking with some fellow ketonians the other night in a Facebook group and someone asked if they could substitute a few ingredients, as if I’d be upset if the didn’t follow my directions to the T. In baking it’s important to follow directions overall due to the nature of that process but as I told her and anyone else…recipes are just a list of suggestions. You have to look at any recipe and decide what ingredients you have on hand and which ingredients you’ll either omit or substitute. If I right a recipe with Sambal Oelek (spicy chili paste) and you don’t like spicy food just leave it out or add a dash of chicken stock instead. If I post a recipe with broccoli and you’ve only got Brussel sprouts then just use brussel sprouts. Now I understand that in saying this I’m assuming you have some basic cooking skills and can make creative substitutions to fit your palate and pantry. 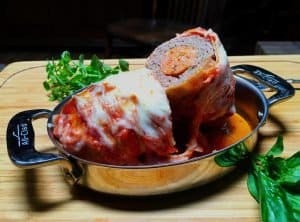 If you’re new to cooking and not familiar than you may not want to vary too much from the original recipe but over time you’ll become more familiar with different ingredients and be able to customize recipes to meet liking and dietary needs. 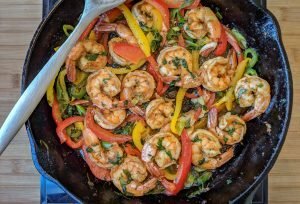 You may find a recipe like this has more carbs then you want to consume that day and you might consider adding extra protein like shrimp or chicken and reduce or remove some of the veggies in this dish. When people say that’s not Keto or that has too many carbs I don’t think they understand that if I’m only eating one meal a day…as I often do or that my breakfast consisted of steak and eggs yielding zero carbs I can have a higher carb meal that day without going over my macros. Keto may seem restrictive to some but to me it’s incredibly flexible. There are so many different tasty and nutritious ingredients to choose from. 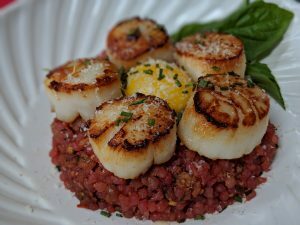 Look, I love grains and sugar as much as much as anybody but when I look at all of the amazing food I get to eat everyday I can ditch the carbs without regret. Miracle Rice?? What’s up with that. 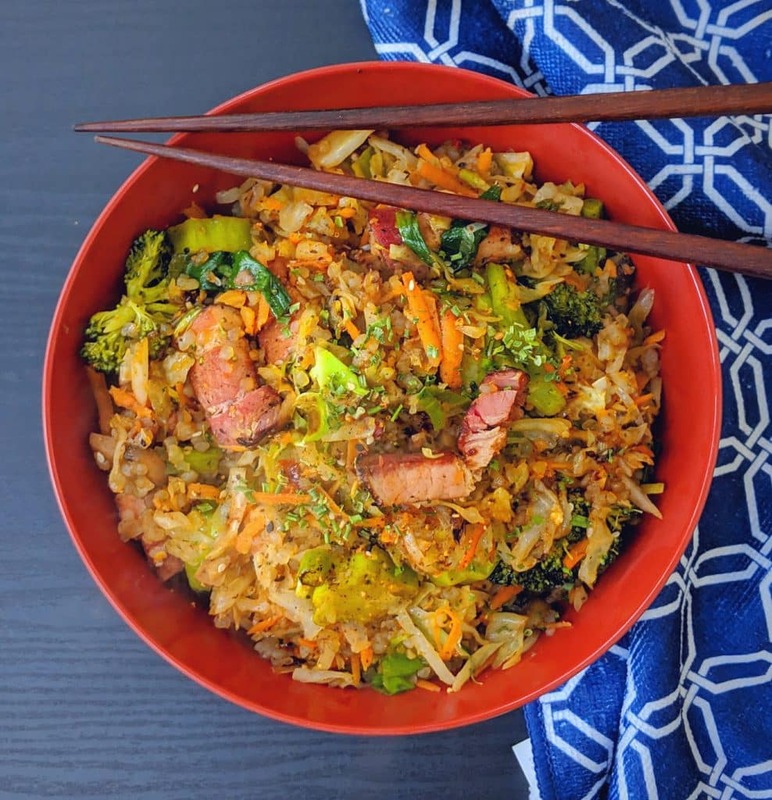 Yes, as I’ve explained before in other recipes like my Drunken Noodles or Spicy Thai noodles I use the konjac based product to fill me up without adding calories. One bag of miracle rice has only 30 calories and zero net carbs but when added to any recipe it seems to fill me up for hours and hours. As far as flavor goes, there is virtually none. The little pearls of konjac act as sponges absorbing all of the flavors of the recipe and especially in the case of the miracle rice you barely even notice it’s there. Depending on how many meals you want to yield you may want to add an extra bag to stretch the recipe even further. If weight loss is one of your goals as it is mine I would definitely recommend any of the miracle noodle or rice products. I alway encourage you to rinse them thoroughly under hot water for a minute, pat them dry then sauté them in a pan to get rid of any excess moisture. This extra step really helps the konjac tighten up and improves the mouthfeel of the dish. In a pan over medium heat sauté pork rendering out the fat. Add drained and rinsed miracle rice to the pan to remove any excess liquid. Next add the cabbage mushrooms and scallions, continue to cook until cabbage is tender but still has some texture. Add remaining ingredients and stir for just a minute until combined. For additional flavor and creamy texture and a tablespoon of mayo on top. Sounds strange but it will blow you away.